That's a momentum pun. Anyway, it only seems like five minutes since we were reviewing the PXC 550 headphones from Sennheiser, and now we're back once again in very familiar territory. However, there's no over-the-head, noise-cancelling, heavy-duty, super-duper headphones for us today, as we've been testing Sennheiser's latest attempt to make listening to music as light and as easy as possible. 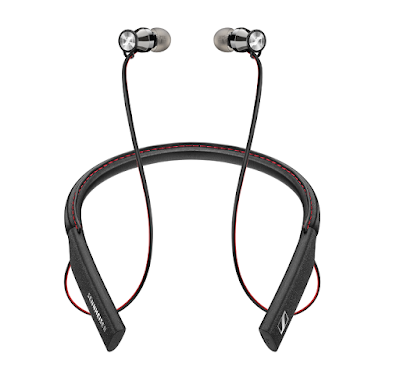 We check out the Sennheiser MOMENTUM In-Ear Wireless Headphones. These headphones are of the 'back of the neck' type, where the main body of the unit, where the battery and Bluetooth connection bits live, sit comfortably at the base of your neck. It is a design which seems to be becoming increasing popular, and one we're starting to favour as well. Other examples can be found here and here. But don't dwell of those, dwell on this. The Sennheiser MOMENTUM In-Ear Wireless Headphones stand out from the crowd first of all because of the materials used. The neck band is uniquely wrapped in leather with thick stitching running along the top edge, while the ear buds themselves are shiny chrome. 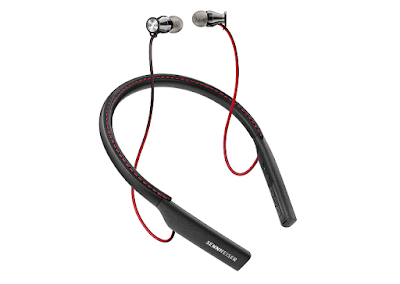 As you'd expect from any Sennheiser product, they feel sturdy and tough in the hand, while also being reassuringly flexible. The Sennheiser MOMENTUMIn-Ear Wireless Headphones feature Bluetooth 4.1 and boast the apt-X profile compatibility for zero latency (so great for using them while watching a show on your phone or tablet). They also feature one-touch NFC pairing, which is also quite unique for headphones of this size. Needless to say, connecting them to a music device was a total doddle. The earbuds some with four different sizes of gels, so you should be able to find a snug fit. As the wires for the monitors sprout from toward the ends of either side of the neck band, they are a tad longer than other headphones we've reviewed like this. That isn't a problem, but if you're a smaller person with a shorter distance between your collarbone and your ears, you might be left with a lot of excess wire flapping around. Each to their own, but we've always preferred headphones like these to have wires that come from the back, on the band itself, as it just seems to make a bit more sense. But despite that one design quibble, we all actually thought that they were comfortable to wear for prolonged periods – and that is something you might do. 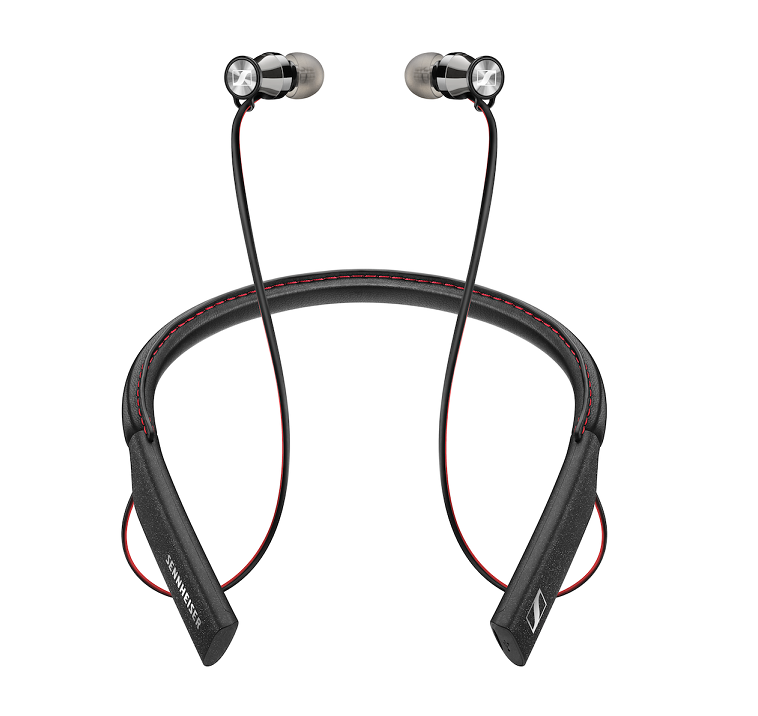 The Sennheiser MOMENTUM In-Ear Wireless Headphones comes with a very good mic built in, and as they vibrate when you receive a call (providing they're paired with your phone) you can easily pick it up and start talking immediately. The controls for calls and volume are right on the neck band and are easy to find even without looking. So as a Bluetooth headset that doesn't have to hang from your ear and make you look like an arse, they're great. And the sound? Brilliant. You really can tell that these are Bluetooth 4 headphones, and that they employ some decent materials in their construction, as you feel a little more connected to your music device. Everything sounds sharper, more apparent, and stronger in both clarity and depth. You'll never feel the same immersive quality you get from the likes of the PXC 550, but the reproduction is still impressive for headphones of this size. All genres sounded good, and even tracks with heavy bass came out with a forceful resonance without having to crank up the volume. So an exceptionally good pair of wireless headphones. The style will turn heads, and although the placement of the wires left us wanting slightly, the comfort and sound quality more than made up for it.